Hangzhou Event Unveils "The Trillion-Dollar Opportunity: Chinese Investment In ASEAN"
Hong Kong, September 7, 2018 /Isentia Wire/ - The thought leadership report titled "The Trillion-Dollar Opportunity: Chinese Investment In ASEAN" offers a comprehensive review on managing risks and seizing opportunities along the Belt and Road Initiative (BRI). "This is a timely report as China's important Belt and Road Initiative was launched five years ago, and this report offers detailed analysis of the achievements and challenges this national initiative has encountered in this past five years," says Nina Xiang, managing editor of China Money Network. China's Belt and Road Initiative (BRI) turns five this year. With maturity, comes expectations, and, as with all global economic programs, expectations beget more expectations. In other words, the BRI is now entering a new phase and Southeast Asia will be front-and-center of China's Belt and Road Initiative. While the BRI is considered a long-term objective, few can argue that the state-backed program will evolve into one of the defining geopolitical moves of our time. The numbers alone point to an unprecedented opportunity: two-thirds of the world's population potentially touched; projections of US$4 trillion in investment forecast; and approximately 2,000-plus infrastructure projects on the cards. Using all metrics, the size, scope and expectations of BRI are high. With geopolitical and economic tensions ripe globally, the world is watching and ASEAN will be one of the main theaters. The role of the BRI within the Association of South East Asia Nations (ASEAN) provides a window into how China's masterplan will evolve. Location-wise, many obstacles are removed in terms of logistics. Politically, the Chinese government has also signed numerous Memoranda of Understanding (MOUs) and trade agreements with ASEAN markets, paving way for new BRI projects. ASEAN and China have long-standing commercial and cultural links, underscoring the implications of the BRI to the South East Asia bloc. Supply chains between the regional economies are firmly established, investment corridors continue to open and from China's point of view, the ASEAN region has a strong track record as a testing ground for international expansion. Since the launch of the China-backed program, ASEAN has been a major recipient of outbound capital flow. Singapore alone accounted for around half of China's total overseas direct investment in the BRI zone in 2015. Elsewhere, Indonesia, Vietnam and Malaysia have appealed to Chinese investors and more outbound capital is already earmarked to arrive. Given this backdrop, the BRI has been welcomed in ASEAN, in the first phase at least. The big question remains though, what happens next? More investment will be high on the agenda for both sides of the transaction. Identification of specific sectors for investment will also be a priority. 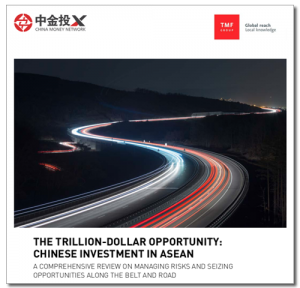 “The Trillion-Dollar Opportunity: Chinese Investment In ASEAN" report abstract can be downloaded at chinamoneynetwork.com. "This is a must-read for investors and business leaders to learn about the most updated developments for seizing opportunities and managing challenges in China's signature globalization program. Join us on 13 September in Hangzhou, China as we unveil the most anticipated, comprehensive BRI report so far," says Naveet McMahon, managing partner of China Money Network.